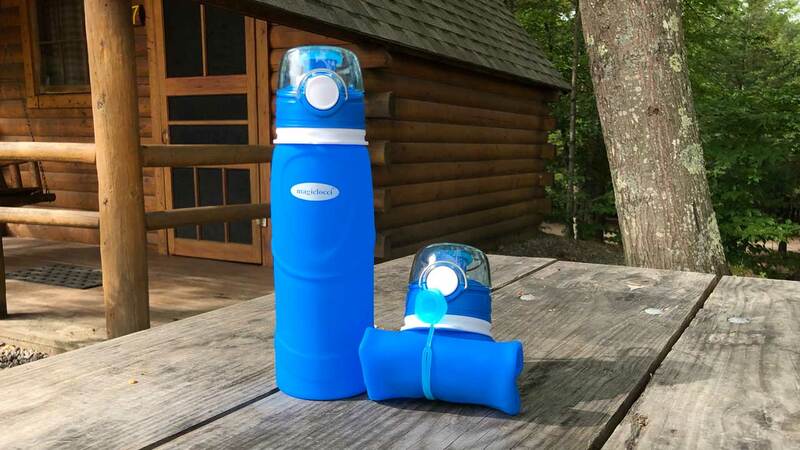 Recently on Amazon I purchased the blue 750ml version of the Magiclocci Collapsible Water Bottle for a hike to the Franconia Ridge Trail in New Hampshire. I had enough hydration for myself with My Osprey Talon 33L’s built in hydration pack but on this hike I was bringing a four legged guest, Erin’s German Shepherd “Willow”. I didn’t have time to go to REI and purchase a name brand bottle so just like most people these days I headed to Amazon, read the reviews, checked prices and selected the Magiclocci. (BTW I cant get the Seinfeld episode out of my head where Jerry says to Kramer and Newman with regards to a spit by Keith Hernandez of the New York Yankees “That is one magic loogie”) This water bottle is pretty cool but it isn’t magic lol. 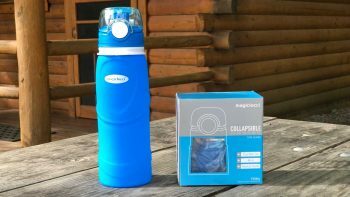 The Magiclocci Collapsible Water Bottle appears to be only available from Amazon as I did not find a manufacturers website. It also appears to be identical to a few other brands of water bottle offered such as Chicmoda, ValourGo, Kemier and Silbyloyoe. Anyhow the bottle comes nicely packaged and rolled up. This really shows you how small this bottle can be rolled up. It’s important to note if you use the bottle and collapse it make certain you open it and expand it later to dry it out to avoid mold and mildew. The body of the bottle is a very soft flexible rubber called silicone. It has the feel of anti-slip bumpers and such. This rubber is super tacky for lack of a better word. In fact this tackiness is my only issue with the bottle in that it made a full bottle a little difficult to remove from the side mesh pockets of my backpack. This can also be a plus as there is little chance the bottles would ever work themselves out or fall out. Again not a big deal I just had to work a little harder to retrieve the bottles. The rubber of the body seems really tough, damaging it would probably take some effort. The top of the bottle is pretty interesting, first off it seals very securely with a leak proof silicone seal. The amount of air in the bottle is controlled by a valve. Because the drinking valve is also sealed there needs to be a way to allow air into the bottle. The valve serves that purpose. It also aids in keeping the bottle rolled or folded up by keeping air out of the bottle. The top of the bottle is protected by a locking cap that requires a button be depressed to open it. The bottle also features a couple different hooks to hang it with. Empty the bottle is rolled up like a tube of toothpaste and secured with a silicone strap. All in all very well thought out. 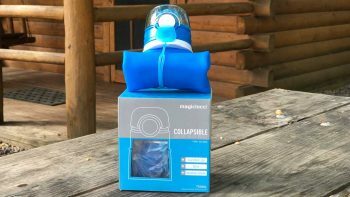 But how well the Magiclocci Collapsible Water Bottle work in the field? Keep reading and find out. Before use I suggest filling it with water and some lemon slices or wedges and letting it soak to remove the rubber taste and smell if those things bother you. I was in a pinch and used diluted white vinegar. 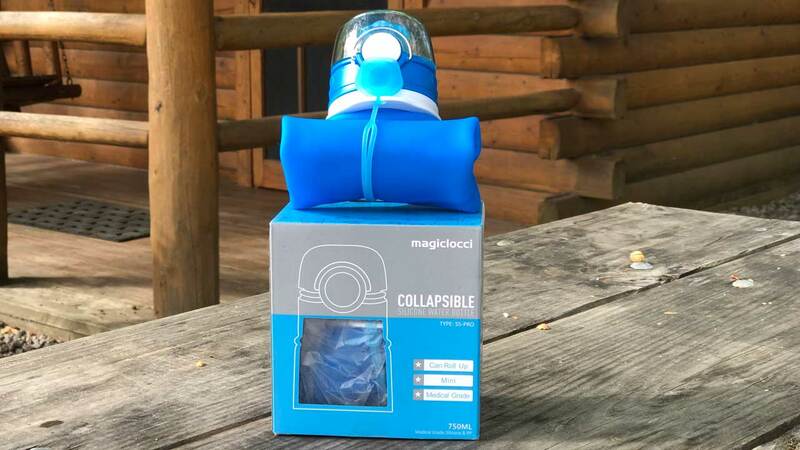 Magiclocci Collapsible Water Bottle is a little funny to use at first as it’s very flexible. Empty it’s just rigid enough to stand on it’s own. Filled with water and it’s just about as rigid as any other water bottle. Filling the bottle is obviously a breeze with it’s wide mouth and surely no issue with ice cubes. I skipped the ice and filled up with some Poland Springs. I stowed the bottles in the side mesh pockets of my backpack where they securely remained until about half way through the hike. At that time my niece Erin took possession of one bottle for Willow. As it turns out I was lucky to keep a bottle for myself because I finished my Osprey hydration pack with about an hour and a half ascent to go. Finally I went to use the bottle and was met with my one and only complaint. The silicone is so “non-slip” I struggled to pull it out of the packs pocket. This was compounded by the bottle conforming to the tight straps. It took me longer to write it out than actually access the bottle. Other than that the bottle worked as designed. Squeeze the bottle and get water, depress the valve, let some air in and squeeze more water out. I fell twice and the bottle did not break, the cap remained secure. It’s a $13 water bottle how excited can one get? 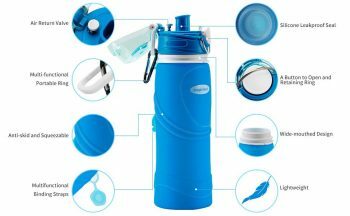 FOLDABLE & PORTABLE: This light weight collapsible sports water bottle maintains its sturdy shape with or without liquid. 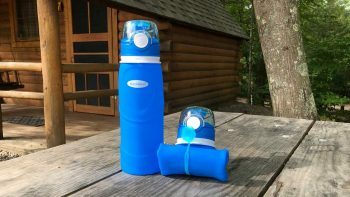 Squeezable water bottle is foldable for compact travel storing, attaches to your bag for quick and easy access. HEALTHY & DURABLE: Made of 100% food-grade materials, 100% Non-BPA & FDA certified material with no harmful toxins, this safe and environmentally friendly water bottle has zero aftertaste or odor. Shatter-proof silicone body make it soft but durable, won’t break by falling down. Safe for children. WASHABLE & REUSABLE: Dishwasher safe on the top dishwasher rack. Easy to wash by hand as well. LEAKPROOF: Triple leakproof with silicone, one dust-proof cover which is better than normal bottle and help you to protect from leak and dust. VERSATILE: Handles hot or cold drinks; freezable; collapsible; easy to refill and add ice cubes or fruit through wide mouth. It’s ideal bottle for fitness, gym, training, traveling, hiking, camping, ect. Made of thick and flexible BPA-free silicone, the reusable Magiclocci water bottle maintains its sturdy shape & feel for a comfortable drinking experience, yet it conveniently rolls up or squashes down for compact storing when space is tight. Attached multi-function silicone strap secures the flask in its folded position and makes it easy to carry with the handle when you’re on-the-go. Foldable for traveling, hiking, camping, traveling, spending time outdoors, at the gym, or school and etc. One dust-proof cover which is better than normal bottle and help you to protect from leak and dust. In between sips, the hinged auto-open cover doubles as a hygienic spout cover, preventing germs from getting onto the mouth piece and into your drink. A button to open is so easy and handy, wide-mouth design makes it easy to add ice, refill and clean. The Magiclocci bottle was designed and rigorously tested for health conscious consumers. Made of all food-grade materials, free of BPA, phthalates and other leaching chemicals. Designed with ideal features and vibrant colors, the Magiclocci was crafted to look as good as it performs. Available in a variety of colors, making great gifts for friends, family and co-workers. Built for ruggedness, the Magiclocci bottle is safe for hot drinks and to freeze. The bottle’s body is made of shatterproof silicone, making it tough enough to survive those accidental drops. The Magiclocci Collapsible Water Bottle is a safe purchase at $14. It’s a water bottle and it works great for hiking and backpacking.